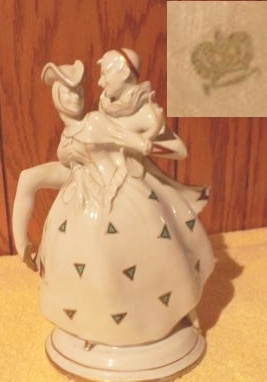 Pottery Mark Inquiry - Green Crown with no other words or incises:- Hello: I was wondering if you could help me determine the maker of this figurine. It is of a couple dancing. It has a green crown marking with no other words or incising on it. It measures 8 1/4" tall and has a shiny glaze on it. The bottom is unglazed and has a small firing hole in it. I see no stilt marks either. I have searched for green crown pottery marks but the list seems endless, lol. She has a broken off thumb but otherwise is in very good condition. No crazing, chips, etc. Just catching up with submissions - sorry to take a while. Thanks for sharing your pictures, thanks for sending in. It is great to now see the actual item together with the mark. VERY nice modeling. This is exceptional. Has a German, Rosenthal look to it and I would be amazed if this modeling did not prove to be antique (latest 1920's). I like this piece very much, everything about smacks of quality, quality and more quality. I wish I knew more about German figurines and pottery marks (I feel pretty sure it is Germanic - the styling and quality just looks that way - Nymphenberg, Hutchenruther, Fürstenberg, Rosenthal or maybe a less well known maker). Let's hope someone else comes across this listing who knows a bit more than me. The above page helps my visitors liaise with experts and get values and identifications. People need to take into account the changing market in the current economy. Items fetching premium prices a couple of years ago are no longer, and other things becoming 'fashionable'. You need specialist knowledge for this kind of stuff. Thanks for sharing - I love this piece. WOW! I have looked all over for a Rosenthal pottery mark that resembles this one and haven't been able to find it. Maybe you will recognize the crown mark? Hi Peter, did you decipher its origins, regards, Eamonn. I would love to know the origin of this piece. The sculpting is obviously of very high class. Is this a reproduction from original old moulds, or something like that? If anyone can enlighten us please give a shout.